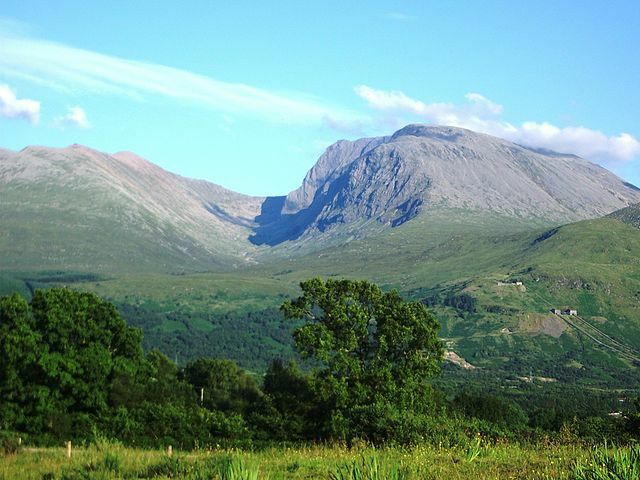 English: Ben Nevis, 1,344 metres, Scotland. Photograph taken from Banavie about 8 km north west. 18:55, 11 July 2005. The summit is beyond and to the left of the apparent highest point, Càrn Dearg North, 1,221 metres, (many Scottish mountains are called Càrn Dearg). Càrn Mòr Dearg, 1,223 metres, is to the left, connected to the Ben by the Càrn Mòr Dearg Arête at the head of Coire Leis (slightly in shadow). The pipelines of the Lochaber hydroelectric scheme are visible lower right. Lakaet eo bet an oberenn-mañ en domani foran gant e oberour, Thincat. Talvezout a ra kement-mañ evit ar bed a-bezh. Reiñ a ra Thincat aotre d'an holl da implijout an oberenn-mañ evit ober ne vern petra, hep tamm bevenn ebet estreget an hini lakaet gant al lezenn.